Although not specifically referred to by name in the Alaska Statutes, a grant deed can be used in this state as an instrument of conveyance to transfer property from one person or entity to another person or entity. A grant deed must be signed and sealed by the grantor, and acknowledged or proved, and then recorded in the registry district where the property is located as provided by law. 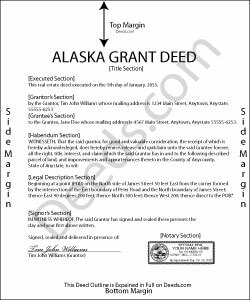 A grant deed in Alaska warrants that the grantor actually owned the title to transfer. This type of deed also includes a guarantee that the grantor has not sold the property to anyone else, and that the property is not under any liens or restrictions that have not already been disclosed to the buyer, which in turn means that there are no legal claims to the property by third parties. A grant deed for real property in Alaska needs to be recorded in order to provide constructive notice of its contents to subsequent purchasers and holders of a security interest in the same property or portion of it (40.17.080). A grant deed in Alaska is void as against a subsequent purchaser in good faith and for a valuable consideration of the same real property or part thereof whose conveyance is first duly recorded. If not recorded, a grant deed will be valid between the parties to the deed and those who have actual notice thereof (40.17.080). Connie H. said: I really appreciated the detailed instructions provided with the document. The instructions made it easy to fill it out correctly. Filed the document with the courthouse the next day and have received confirmation that it has been filed. Reply from Staff: Thanks Connie! Have a great day! David W. said: Excellent service! Questions were answered promptly, and the entire process was easy and fast. Thank you! SHARON D. said: This is one of the easiest sites to purchase and download needed forms. I would highly recommend this site. Reply from Staff: Thank you Sharon. We really appreciate you. Enjoy your holidays. James W. said: Easy access to forms saving lots of time researching reqmts from a State/Municipal Govt website. I saved 400-500 in lawyer fees but getting these forms, and coordinating with the Property recorders office in another state. Will use you again. Reply from Staff: Thank you James. We really appreciate your feedback. Select Borough or Census Area where the property is located.